Field sanitation | Infonet Biovision Home. 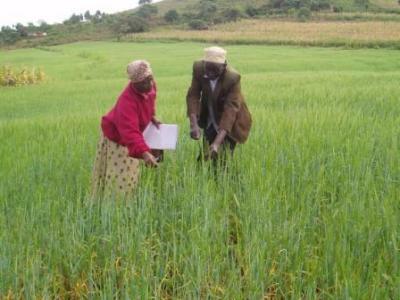 Field sanitation is an important and highly effective farm practice to keep most diseases and pests under control. It involves removal and/or destruction of sources of diseases, pest infestation and weeds from the field. On a vegetable crop, pests and diseases may survive on volunteer plants (crop plants which come up on their own after the main crop has been harvested). These volunteer plants should be destroyed. The same applies to some weeds which are also hosts of pests and diseases. If an old diseased or pest infested crop remains nearby when a new one is planted, it is likely that the pests or diseases will move over to the new crop. For example, if spider mites are present on a crop they will surely move to the newly planted. If the old infested crop is upwind the pests will almost certainly be blown onto the new crop. If possible, get rid of the old crop first. If the sticks or canes used to support a crop such as tomato are used for a second time, disease pathogens and pests may be present on them, so they should be washed thoroughly with hot water, dilute bleach or strong soap before being re-used. Hot-water treatment of seeds can avoid seed borne diseases such as Alternaria spp., Colletotrichum spp., Phoma spp., Septoria spp., and bacterial pathogens (Pseudomonas spp., and Xanthomonas spp). Practise crop rotation: soil borne pests and diseases such as nematodes, club root in cabbage, damping-off and many others are prevented from building up. Avoid rotating crops of the same family. Control aphids and whiteflies: the leaf mottling or curly leaves often show that there are plant viruses building up. They get carried around by suckling insects such as aphids and whiteflies.